The line between memory and fiction is often a thin one. Yet the space it delineates can also contain surprising depth. Icelandic writer Oddny Eir’s Land of Love and Ruins pushes that line to its limits, and plumbs its profound depths to remarkable success at the same time. The book takes the form of a diary chronicling a year in the life of its narrator, a 30-something Icelandic writer with lively political convictions and an inclination toward the mystical who’s just moved back home to her family after being separated. The bulk of the book focuses on her relationships with her brother (an archaeologist), her new lover (an ornithologist) and what family members she stumbles across in this mid-life-crisis year. Eir’s use of the diary genre renders the work almost inevitably self-reflexive and inward-focused. It’s a quest for peace with oneself, and for the proper balance between one’s own identity and those of the people around you. When you fall in love after suffering heartbreak, how do you re-align your emotions with those of someone new after those emotions have already been so terribly damaged? You can’t enter another person’s world too quickly; you’ve got to sift things out. I’ve often set out rather carelessly, say no more, over and out. When I saw him, I found him so grown-up and mature that I imagined he’d cleaned out all his old junk and rubbish. Disappointing to discover the infantile fluff still in his navel. But you never fully cleanse yourself of prehistoric shame and dirt. As soon as your heart opens, its waste pours out along with the love. But then it’s a good idea to keep pumping and pumping, replace your septic tanks and your connection with the sea, so that you can enjoy peace and quiet in your own house, your own privy place. The diary-novel is set in the period immediately during and after the political turmoil of Iceland’s financial crisis. There’s a palpable sense of rage at the impunity and unaccountability of the wealthy and powerful; the protagonists are both driven by the sense of conviction that their political organizing can make a difference, and the underlying doubt that things will ever really change. There’s a back-to-nature vibe to the book, a very Icelandic sense that the financial crisis was a warning cry not to become too removed from the traditions that formed you and the natural environment that shaped you, no matter how attractive the flashing lights of big cities and the big bucks of land speculation might seem. We’ve got to rethink the relationship between private ownership of the land and public ownership of resources. Finally, water is being legally classified as a resource. But what about the desolation, the beauty and the spiritual space, the atmosphere? The fact that the two key characters in the narrator’s life -- her brother and lover -- are an archaeologist and ornithologist, respectively, lend themselves well to the book’s broader themes. ‘Owlie’, the archaeologist offers a useful entry to the narrator’s discussion of the cultural traditions that shaped Iceland’s past and present; ‘Birdy’ the ornithologist, offers a useful vehicle for her consideration of the sustaining importance of the natural world. The setting shifts as the author alternates between contemporary reflections, flashbacks, and travel outside of Iceland. Eir, whose work tends toward the autobiographical, leaves the impression of having bound together a series of personal impressions and memories from different places and times. But the overall effect is not disjointed; the fact that the book as a whole adopts a reflective tone means that setting, space, time and other measures of continuity do not matter as much as tone and atmosphere. Indeed, it’s sometimes difficult to follow the progress of the narrative, but that doesn’t detract from the attractive prose and feeling that the entries evoke. Passages sometimes verge on the poetic, and a beautiful, satisfying insight can often be its own reward, no matter what it contributes to the broader narrative. I remember that I had a good time in the Blue Mosque, thought of something very important there but don’t remember what it was; wrote it down but in what notebook, I don’t know. While there I had a passion for roses and the color blue, and was completely enthralled by the Mosque of Blue Roses. Came out of it with an Indian writer and we bought a warm-milk and lotus drink spiced with cinnamon and had a look at statues of holy men that appeared more akin to teddy-bears and discussed doctoral dissertations that grow so long they take revenge on novels. Also discussed literary diversity in the spirit of biodiversity. How can we nurture marginal forms in literature? Then I saw a wall covered with ivy, which probably inspired my passion for it, taking over from my rose-passion. I wondered how the strands crawled up along the continent, across all borders, over the bullet wounds on buildings and the ax scars on trees. Perhaps there’s a message here: don’t worry about how the moments of your life add up to a coherent narrative, and where your life is going: just immerse yourself in the totality and beauty of each moment. Feel the earth around you; feel the lover beside you; feel the fresh ocean air drifting inside the lava cave in which you’re making love. The point is not to forget or ignore the future -- especially in a time of economic and political crisis -- but to recognize and fully appreciate the value of past and present moments in shaping that future and your response to its emerging needs. To be able to live on the heath and say whatever you like! And look at whatever you like; do nothing but stare at the mountains. It should be small enough, your hut, that it’s impossible to do anything else in it but think and look at the mountains. The value of the past and tradition is an underlying theme: the narrator goes off in search of her ancestors’ land and homes, and frequent references to the Icelandic sagas emerge in everyday activities. Yet Eir has written no blind paean to the past: Snoop Dogg has his role to play in her Icelandic present, as well. The book speaks, perhaps, to the very European tension between unity and particularity; the pressure to conform to the norms of all-encompassing political entities juxtaposed against the desire to retain a sense of the unique place that one's personal past and cultural traditions came from. The positive reception of the book within Europe suggests Eir has struck a nerve that resonates: her book won the Icelandic Literary Award in 2011, the Icelandic Women's Literature Prize in 2012 and the 2014 European Union Prize for Literature. How much is real and how much is fiction remains unclear to the reader. Eir’s work blurs the boundaries, but like all good fiction this is merely another example of how real life experience can be used as the jumping-off point for imagination. Eir herself has organized environmental activism; her brother actually is an archaeologist in real life; she places herself in the text which nonetheless conveys the sense of a magical fantasy at points. 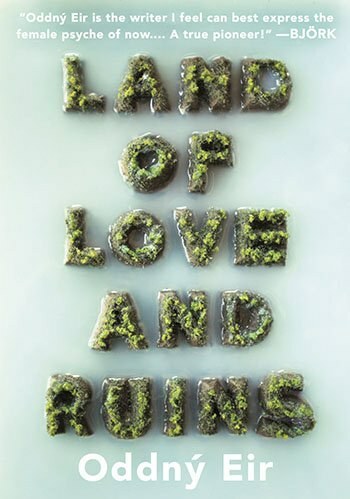 Land of Love and Ruin is a rewarding, if deeply reflexive little book. It pokes and prods at philosophy and sociology, but never excessively, always couching them in a framework of feeling and everyday life. The diary mode is again a useful vehicle for bringing together such varied directions: the narrator’s musings range from Icelandic sagas to Greek mythology; from Confucianism to Hannah Arendt. I think that in the housing of the future, there needs to be a little healing nook where you can lie down as if under the grass or down in the ground and let the earth heal you. Then rise up. Christianity is perhaps first and foremost an admonition to ground yourself so well that the light can play around you without burning you up, an admonition to connect with nature, turn to dust each day and rise up from the dust, transcend the laws of nature with the help of the laws of nature. You mustn’t bury yourself alive, forget to rise up or bind yourself to the dust in melancholy surrender. There are no conclusions to be found in such a work, which borders the poetic and prose, memory and fiction. The pleasure here is to be found in the journey.